Sales transition from eBay to dedicated platform after eCommerce success. The Breyer Molding Company model horse and three like it sat on the shelf at a Salvation Army thrift store in Spokane, Wa., priced at $1.89 each. The lot sold at auction on eBay a week later for $3,939. 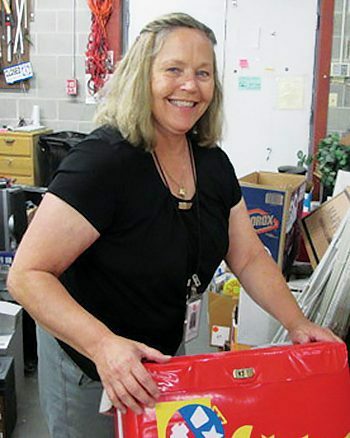 Bafaro spends a couple hours a day sifting through donated items, looking for those that would sell for more online—from collectable horses to a stereo receiver, golf shoes or three-feet-tall light-up plastic toy soldiers (all items she did sell online). She is one of 13 dedicated employees of the division’s eCommerce effort, which launched in January 2014 and now operates out of 10 corps-operated stores. The online auction lets the market dictate the value of the item, which to date has produced $244,000 in gross sales. Casey Edwinson, eCommerce manager, developed a system that allows the Army to run one online eBay storefront through its multiple thrift stores. The eCommerce specialists scour store shelves, shoot and post product photos and descriptions to eBay, ship sales and respond to customer emails. After a 4.8 percent combined fee to eBay and PayPal, the discounted rate given to nonprofits, sales income is received at divisional headquarters and then attributed to the store of origin so that the profit funds local programs—such as in Yakima, Wa., where the food bank is part of the store. Bafaro said it takes a knack for seeing quality in an item and an attention to detail to craft its description to be both accurate and appealing. On a whiteboard in the store, where employees take guesses on final bids for their most promising items at auction, Bafaro tracks words she’s learned—like “epergne,” a flower vase with three horns. She recently sold one for $300. Given its success, Edwinson is taking eCommerce a step further. He opened the Army’s own auction site, shopthesalvationarmy.org, in May. A limited product selection is posted daily to the site, however high-value items will continue to post to eBay for now. In addition to no fees, the Army’s own auction site will also allow analytics and customer data to help The Salvation Army connect better to people. It’s not a novel effort—Goodwill Industries launched the first nonprofit auction site in 1999, generating $250 million in its first 15 years. The site offers items for auction from Goodwill stores across the country, and its advantage, Edwinson said, is its unified approach. It is an undeniable market in the U.S. as used merchandise stores bring in a combined annual revenue of $15 billion. Thrift stores—those that sell mostly donated goods with proceeds going to charity—generate $9 billion of that amount, according to IBIS World. To start, Edwinson is working to incorporate stores outside of the Northwest Division, proving that he’s settled the kinks and knows how to overcome the challenges of operating one online storefront from many stores. To join, a store simply needs a desk, packing supplies and an eBay specialist, willing to treasure hunt.